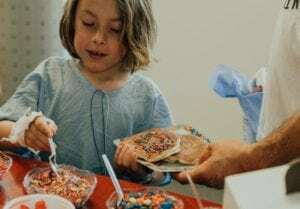 Earlier this year, we were given the opportunity to host a patient “pancake party ” for the kids at Children’s Healthcare of Atlanta. It was neat to see how quickly IHOP donated pancakes and The Center for Allergy and Asthma donated toys to keep the kids busy during their hospital stay. 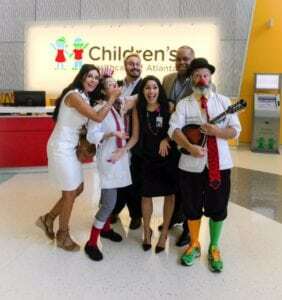 This truly shows the love our community has for Children’s Healthcare of Atlanta. The Georgia Drug Card team was truly blessed to spend time with these special kids and put this party together. The Child Life Zone is definitely an extra special place for patients to have the opportunity to get out of their rooms and enjoy being a kid. More recently, we were given a behind the scenes tour of the hospital and saw first-hand the impact that our donation makes on the hospital. Children’s Miracle Network representative, Nancy Koenig, gave us a tour of the various departments at Children’s Healthcare of Atlanta. We were very impressed with their systematic process of moving patients along as well as the efficiency of their ER. Their attention to detail is what makes Children’s a special place. An example of this is how they keep the same movie consistent throughout all areas and all departments. By doing this, a child getting moved from the waiting room to a hospital room won’t miss a beat. Seems small but that’s “thinking like a kid”. 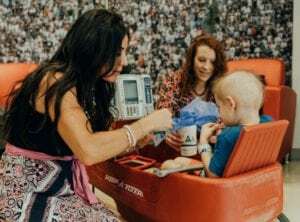 We look forward to future opportunities to work with Children’s Healthcare of Atlanta after seeing first-hand how our donations help kids in our community. The Georgia drug card program helps with high “out of pocket” prescription cost. If you need help with prescription costs, download a card or get more information at www.georgiadrugcard.com. This is a free program, no enrollment, 100% HIPAA compliant, and we are endorsed by the Medical Association of Georgia. The Georgia Drug card is here to help you with prescription assistance. By using the program, you can help save on your prescription and help support your local children’s hospital, Children’s Healthcare of Atlanta.